The New and Emerging Researchers Awards have been run by Community Research since 2009. We select New Zealand’s finest New and Emerging Community Researchers who present their research at a one-day Community Research Seminar. The 2011 Community Research Seminar was held at the Unitec Marae, Mt Albert, Auckland on Thursday 17 November. Around 50 people from 8 tertiary institutions, 17 community organisations, 2 government agencies and one philanthropic trust attended. Six new and emerging researchers presented their research and received feedback and awards. The 2010 Community Research Seminar was a one-day gathering for the Tangata Whenua, Community and Voluntary Sector. It was held on 1 December 2010 at the Kuratini Marae, Massey University, Wellington and was supported by Unitec and NZ Lottery Grants Board. The 2010 New Zealand Community Researcher Awards were presented to five emerging researchers, who each spoke on their research topics, plans and progress and engaged in constructive conversations with the Seminar participants, all of whom had special expertise or interest in community research. Sue Bradford (AUT) – Research design issues for PhD exploring what conditions would enhance the development of a left wing think tank in New Zealand? Fay Pouesi (Unitec) – The validity of a ‘community of care’ approach as an alternative to working with Maori Women who have experienced domestic or intimate partner violence: A case -study of Westside Counselling Services in West Auckland. Wendy Henwood (Te Rarawa Iwi Research and Development Group) – Research work in supporting Maori community development in the Far North. In 2009, Community Research received a $3000 research grant from Unitec NZ to provide travel scholarships to enable nine postgraduate students doing relevant masters or PhD research to present at a one day seminar in Wellington on November 5. 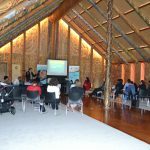 The seminar, held at the Kuratini Marae on Massey University’s Wellington campus, was attended by around 50 people from eight different tertiary institutions, 17 community organisations, two government agencies and one philanthropic trust who all shared an interest in this research. This was the first time such a seminar has been organised in Aotearoa. The Tangata Whenua, Community and Voluntary Sector Research Centre’s initiative in building support and dissemination networks for postgraduate research related to this sector in Aotearoa was very positively endorsed by all who attended. Unitec NZ funding and the Research Centre’s subsidy of the event was acknowledged at the seminar and much appreciated. Awhina English (Otago Uni, PhD) – Kaimahi Māori – Working in Social Service Organisations. Marnie Carter – (Massey Uni Postgraduate Diploma in Social Sector Evaluation Research) Increasing quality in out of school programmes: Navigating tensions during the development of a national quality assurance system. Ann Sharley (Uni of South Australia, PhD) – Art builds capacity, art builds community: Changing people’s lives through the arts.